50 Kennedy Plaza (formerly known as Fleet Center) is a Postmodern skyscraper in Providence, Rhode Island. At a height of 285 ft (87m), it is currently the sixth-tallest building in the city and state. 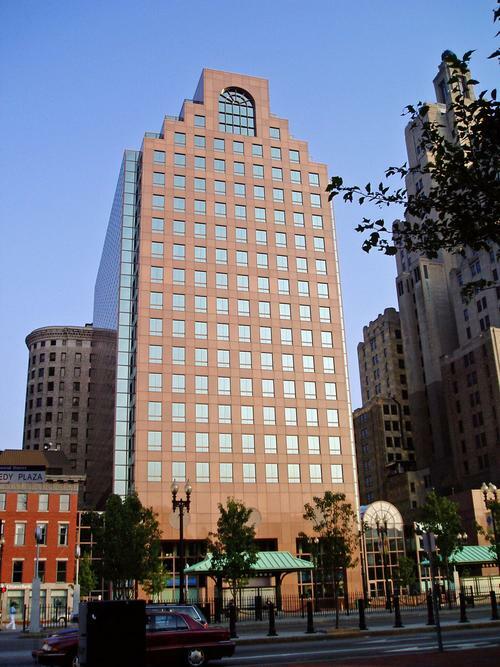 The building is named for Kennedy Plaza, which it abuts. Notable occupants with headquarters in the building include Fortune 1000 company Nortek, Inc. and private equity firm Providence Equity Partners. Its exterior façade is done in "granite framing green-reflective-glass side elevations". Its location, sandwiched between the 130m Bank of America Building and 125m One Financial Center, ostensibly detracts from its height with architectural historian W Woodward calling it, "a trifle too low for the site". Though, in the company of the aforementioned buildings, it forms part of one of the most identifiable parts of the Providence skyline. It is this section of the Providence skyline that is featured on the television show Family Guy.